Dinner treats re something we all enjoy! I was at my college friend Sam’s place the last evening for a small get together. His wife had recently come back from the US and it was time for all of us to meet. Nitin and Natty were there with both their kids as well! Jisha being the oldest one was the bully of the lot. Girls these days… Aparna had recently learnt how to make Sushi and a few other stuffs from the Japanese cuisine. Now, I had never tasted Sushi any time in my life because I always thought it was supposed to be a non-vegetarian item only and was supposed to be had with caviar. Now, this instance proved me wrong and led me hunting on the web for a recipe of Vegetarian Sushi! Sushi, as we know is a great accompaniment to Black Dog’s Triple Gold Reserve. So much so that, the two can leave you gorging on it and not wanting to stop for hours. Sushi can be prepared with either brown or white rice. Sushi is often prepared with raw seafood, but some common varieties of sushi use cooked ingredients. Raw fish (or occasionally meat) sliced and served without rice is called sashimi. 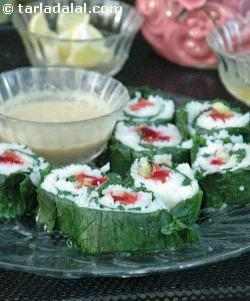 Here’s a recipe of Sushi that I found on the web. Do give it a shot and let me know what you think of it! 1. Combine all the ingredients along with 3 tbsp of water and blend in a mixer to a smooth paste. 1. Combine the paneer, ginger-green chilli paste milk and pepper in a bowl, mix well and keep aside. 2. Blanch the spinach leaves in hot water for a while and refresh them with cold water. 3. Pat dry each spinach leaf with a tissue or a thin soft cloth. 4. Place a butter paper on a dry, flat surface and arrange the leaves such that they overlap each other. 5. Spread the paneer mixture on the spinach leaves evenly, leaving a gap of ½” from all the sides. 6. Place the vegetables at the tapering end of the spinach leaves and sprinkle salt and green chillies over it. 7. Start rolling the butter paper, gently pressing it to compress the arrangements. 8. As you roll the butter paper, gradually unwrap it simultaneously to expose the spinach leaves. 9. Once the sushi has been rolled, use a sharp knife to slice the sushi into rings of ½” width. 10. Serve immediately with peanut wasabi sauce.